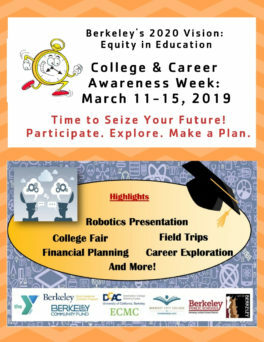 College and Career Awareness Week is happening March 11-15 in all of our schools and I encourage you and your students to participate! There’s been a lot of behind the scenes planning and organizing for several months to put together a series of events, speakers, and workshops that engage and inspire our students to “seize their future!” Thank you Wyn Skeels, James Dopman, Barret Donahue, Jasdeep Malhi, Skyler Barton at Berkeley City College, and the rest of Berkeley’s 2020 Vision College and Career Planning Team for leading these efforts! They’ve set the stage; now it’s our turn to carve out some special time to inform and engage our students about the possibilities! Wear your college and career-related “swag” to school/work on Monday, March 11 as part of the kick-off and to spark student curiosity about your path. Fill in and post this sign outside your classroom or near your workspace. Share your college and career story with students; Invite others in the community to share their college and career paths. Dedicate time to promote student inquiry and foster a sense of wonder about their passions, possible education paths, and the world of work. By sharing our own paths and inviting others to do the same, we encourage students to explore their interests and passions and to be open to the possibilities and opportunities that lie ahead. One of the most powerful messages we can share with our high school students, in particular, is that they don’t have to know what they want to do with the rest of their lives. Together we can make a big impact by teaching our students that their education, training and career paths will be as unique and varied as each one of us. I look forward to next week and thank you for participating! I am writing to inform you that at tonight’s board meeting, I announced that I will be retiring from my position as Berkeley’s superintendent on July 31, 2019. I have been blessed with a rewarding and meaningful career of over 30 years in public education, and I am honored to have had the opportunity to spend my past six years here. With your commitment and engagement, we’ve created more welcoming and inclusive schools. We adopted the Toolbox Curriculum, expanded restorative practices, and changed policies to help keep kids in school. Student leaders successfully challenged us to strengthen our policies and practices to address bullying and sexual harassment. Listening to and working with our students has been an effective and rewarding strategy! We also successfully transitioned to the Common Core and to the use of new state assessments. We embraced the Local Control and Accountability Plan (LCAP) as an opportunity to invest in excellent teaching and to refine programs and services to boost student achievement. Our professional development program has grown and Professional Learning Communities meet to share best practices and further hone our skills and expertise. We now have more effective Coordination of Service Teams at school sites connecting students and families with programs and intervention services to better support them. Active students, parents, and community members helped make our LCAP an effective tool for continuous improvement. Our engaged community also made it possible to pass Measure E1 – Berkeley Schools Excellence Program (BSEP) – in 2016 with a ‘yes’ vote from 89% of Berkeley voters. More recently, we adopted new English Language Arts curriculum materials for elementary and middle school students and supported the high school in the transition to the Universal 9th Grade program. I am also really excited about how far we have come with Career Technical Education! These are just some of the many positive changes we made and challenges we successfully faced together; I am proud of the progress we’ve made. I have great confidence in my current leadership team and in the vision of our collaborative and forward-thinking school board directors. I know that you will continue to pursue excellence and equity in education and focus on the needs of our students. Being able to leave our school district in strong, capable hands has made my decision to retire that much easier. The School Board will immediately begin to discuss next steps. Over the next six months, I will work closely with the school board directors and with members of my executive cabinet to put together a leadership transition plan. My hope is that we will have a new superintendent in place before I retire at the end of July. We are deeply distressed to report that Berkeley School Board President Judy Appel and her wife Alison Bernstein were seriously injured on Saturday, January 5, shortly after midnight, when they were struck by a vehicle as they were walking in Berkeley. They were rushed to a local hospital, and the driver is cooperating with police. A Berkeleyside article provides more details of the accident. We will be offering whatever support and assistance we can to the Appel-Bernstein family and we will provide updates when appropriate. School Board Vice President Beatriz Leyva-Cutler will preside over board meetings while President Appel recovers. Meanwhile we ask the community to join with us in our hopes and prayers for their recovery. I cannot thank you enough for all you did last week to help our students and our district get through the wildfire smoke crisis. Many of you really went above and beyond to take care of our students, our facilities, and each other. I hope you were able to get some well-deserved rest over the weekend. As you know, the air quality has improved since Friday, when Berkeley was far into the “purple” (very unhealthy) zone. Air quality forecast is for the “red” zone on Monday, so the CDC recommendation is to limit outdoor activities. Our full day CDC program and BEARS program will keep students inside until we see air quality in the “orange” zone. For those of you who are working on Monday and Tuesday this week, if you need to be outside for your work, and/or you are feeling the effects of the smoke as you walk between buildings or walking to and from work and would like to have an N-95 mask, be sure to read this information about wearing masks and contact Danielle Perez at 644-8717 if you need one for yourself. We are currently anticipating that Monday we might be in the “red” zone for at least part of the day, improving into “orange” zone through Tuesday. A significant rainstorm is forecast to arrive on Wednesday, which will offer some relief to the firefighters and also bring better air quality to everyone living with the aftermath of this terrible tragedy. As we head into the Thanksgiving holiday, I want to share my gratitude with you. There is so much to be thankful for, despite the very challenging times we are living in. Over the past few months our community and nation have been shaken by fires and other natural disasters, and also by gun violence, and hateful words and actions. And yet – standing up against all the harm and hurt, there are all of you who have chosen to be caregivers, helpers, activists, volunteers, and committed workers who make sure that our community is strong, our children are cared for, and those who are suffering have somewhere to turn. YOU make a difference, every day, and I am grateful for all you do. P.S. Here again are resources for wildfire season that we put together for BUSD staff, and here are some ways to help the victims of the fire. All schools and departments in the Berkeley Unified School District will be closed on Friday, November 16. The Alameda County Council of Superintendents made the joint decision today to close all schools in Alameda County. Making the decision to close schools was not easy. I hope the extra time off will allow everyone to recover from the difficult week. As you know, all schools are closed for the entire week of Thanksgiving, Monday November 19 through Friday November 23. We anticipate the district office and departments will be open as planned on Monday and Tuesday, and the BEARS program at Rosa Parks and Malcolm X is also planned to go forward. I am truly thankful to each and every one of you for what you have done this week under very challenging circumstances. Thank you for all you do, every day, going above and beyond for our students, school and district. Unfortunately the air quality has not improved, and so we have to ask you to continue to follow the same practices of limiting outdoor activities and keeping windows/doors closed in order to limit exposure to the smoky air. Our district is open today, Thursday, November 15. Due to the air quality, we are continuing to limit student activities to reduce outdoor exposure and limit physical exertion. Principals have been directed to keep students inside for recess, lunch, PE, and after school programs. All outdoor athletic practices and events are cancelled until the air quality improves. Our goal is to limit our students’ exposure to the outdoors while keeping them in school and keeping up with schoolwork, while following normal routines as much as possible. Heating and cooling systems have been adjusted to recycle inside air and not draw any air from the outside. The system will circulate the heated air around the building and through the filters in the system while filtering out much of the particulate matter in the air. Families/parents are encouraged to keep their children at home if they feel it is best for them to do so. If students need to stay home today for health-related reasons due to the air quality, parents/guardians should call to notify the school of the decision, and absences will be excused for illness. If students are absent for more than three consecutive days, a medical note may be requested for our records, as per state attendance requirements. We will evaluate whether to continue to keep schools open on Friday, November 16 and will notify families and staff of the decision before the end of the Thursday workday, via email and an automated phone message. The latest forecast for the air quality on Tuesday is in the “unhealthy” (red) zone. We continue to follow the EPA/CDC guidelines for schools, and have notified principals that recess, P.E. classes and after-school activities should be moved inside, and athletic activities should be canceled or modified. We appreciate how hard it can be to work under these conditions. After many days of poor air quality, everyone is likely to feel some level of fatigue and stress – students, staff and families alike. It’s important for everyone to slow down, rest, stay hydrated. If you need a respirator mask due to a health condition and/or outdoor exposure, please request one from your principal or supervisor, be sure you read instructions that go with it, and also please discuss your concerns with your healthcare provider. We currently have a limited supply to provide for voluntary use. However, public health officials are not currently advising wide distribution of masks, and masks are not recommended for children, as they do not fit properly and can fail to protect or may impede breathing. The Communications Team has put together a page of air quality resources for BUSD staff, and we will also share a similar page of wildfire season resources for families, which we hope will answer many questions and provide information you can use to respond to the current situation. Thank you again for all you do, and let’s hope that things improve soon, particularly for those who are directly affected in Butte County and in Southern California. The local air quality remains the “unhealthy” range for outdoor activities. Athletic activities and after-school should be modified so that students are kept indoors for the rest of the day. We will send out an update on conditions late in the day on Monday before return to school. Hopefully over the weekend things will improve, and normal activities can resume on Tuesday, but we are looking into taking additional measures if necessary. We have been checking in with neighboring districts, who are taking similar measures. We’re all doing our best to figure out how to address what unfortunately may be the “new normal” for seasonal fires. I do hope that you are able to have a restful holiday weekend, despite the conditions. Thank you for all you do. PS I’d like to share with you this information sheet from our district nurse about how to recognize and address potential breathing issues due to the air quality, which we are also sharing with our families. The air quality in Berkeley is currently in the “unhealthy” range for outdoor activities. The definition of the “unhealthy” level is that people with heart or lung disease, older adults, and children should avoid prolonged or heavy exertion. Everyone else should reduce prolonged or heavy exertion. For most people, the conditions are unpleasant rather than a threat to health. However, have notified Principals that until the air quality improves, students should stay inside during lunch and recess, with windows closed. Maintenance will be turning off ventilation to reduce pulling in the outside air. This is the same conservative approach that we did in last year’s fire in order to protect our students and staff. We have also asked school secretaries to check that student medical information and authorization forms are up to date. If you or a member of your family has asthma or other respiratory issues, make sure to follow your doctor’s directions, and seek care in a timely manner if symptoms worsen. We will send another update by 1:00 pm today, including a decision about after-school and athletic activities. Thank you, and we hope to have better news by this afternoon. As I’m sure you’ve noticed, wind patterns and increased smoke have shifted the air quality into the “red” zone, which means outdoor activities such as athletic practice should be canceled or shifted indoors for today. We will keep you posted on predictions for tomorrow. You have probably noticed the smoky skies this afternoon. This is due to the large fire in Butte County (about 150 miles northeast of Berkeley). The Bay Area Air Quality Management District is currently predicting that air quality will not exceed air quality health standards. However, we will be monitoring the situation to determine whether any special precautions will be needed for school, afterschool or work activities. We are following the Air Quality Guidance for Schools, as we did last year with the smoke from the fires of October 2017. At this point, the air quality is in the “yellow/moderate” range which would not require special precautions except for highly sensitive individuals. If the forecast for tomorrow trends toward the next higher level, “orange/unhealthy for sensitive groups,” we will notify you and staff. For the orange level, it is still okay to be outside for short activities such as recess and PE, but for longer activities such as athletic practice it would be important to take more breaks and do less intense activities. If you or a member of your family has asthma or other lung disease, make sure to follow your doctor’s directions, have quick-relief medications handy, and seek care in a timely manner if symptoms worsen. Probablemente hayan notado el cielo lleno de humo esta tarde. Esto se debe al gran incendio en el Condado de Butte (unas 150 millas al noreste de Berkeley). El Distrito de Administración de la Calidad del Aire del Área de la Bahía (Bay Area Air Quality Management District) actualmente predice que la calidad del aire no superará los estándares de salud de la calidad del aire. Sin embargo, estaremos monitoreando la situación para determinar si se necesitarán precauciones especiales para actividades en la escuela, después de la escuela o para actividades laborales. Estamos siguiendo la Guía para las escuelas sobre la calidad del aire, como lo hicimos el año pasado con el humo de los incendios de octubre del 2017. En este punto, la calidad del aire se encuentra en el rango “amarillo / moderado”, lo que no requeriría precauciones especiales, excepto a los individuos altamente sensibles. Si la previsión para el futuro se orienta hacia el siguiente nivel superior “naranja / poco saludable para grupos sensibles”, se lo notificaremos a usted y al personal. Para el nivel naranja, todavía está bien estar afuera para actividades cortas como recreo y educación física, pero para actividades más largas como la práctica atlética sería importante tomar más descansos y hacer actividades menos intensas. Si usted o un miembro de su familia tiene asma u otra enfermedad pulmonar, asegúrese de seguir las instrucciones de su médico, tenga a mano medicamentos de alivio rápido y busque atención médica de manera oportuna si los síntomas empeoran. Thank you for your participation in the Professional Development Day on Monday, October 8, 2018. We need your feedback on the presentations and sessions you attended. Please click on the link below to complete this brief survey while the presentations are still fresh in your memory, but no later than 10/26. Election Day is just one month away, November 6, 2018. We want to encourage you to exercise your constitutional right to vote, and also share with you some very important information about the rules regarding public employees and political campaign activity. Check to be sure you’re still registered at vote.org or voterstatus.sos.ca.gov. If you’re not registered, or need to change your address, you can fill out a registration form online or pick up voter registration forms at any post office or public library. There are also forms at 2020 Bonar St. outside the Admissions office on the first floor. The deadline to register ahead is Oct 22. There are many important issues to be decided on the local, state and national level. Voters Edge is a non-partisan resource that helps you learn more about candidates, propositions and measures, and it has a tool to help you keep track of your choices before you vote. Employees have a constitutional right to participate in political advocacy as private citizens. As public employees, we also have a responsibility to ensure that public resources are not used to campaign for or against any candidate or initiative on the ballot. We hope you will join us on November 6 in exercising your voice and making your choice at the ballot box. Please note: If you have any questions about any of the above, feel free to contact Natasha Beery at natashabeery@berkeley.net. She will be reviewing the BUSD regulations on Political Campaign Activities of Employees at the next Board Policy Subcommittee meeting on October 11 and welcomes your questions and input. Thank you. This is just to say, THANK YOU! As we prepare for Staff Development Day on Monday, Oct. 8, I want to take this opportunity to offer a special appreciation for the work you do, and the dedication and professionalism you bring to your jobs. While our teachers and other certificated staff deserve appreciation as well, I want you to know that I see and appreciate the many important contributions of the classified staff. You are essential to our mission; you make everything possible. And I want to give a special shout-out to our custodial employees, who work behind the scenes, day after day, keeping our schools and other District facilities clean, safe, and well-maintained. I’m thinking of you not only because we just observed National Custodial Workers Appreciation Day this week, but also because I know how difficult a custodian’s job can be, and also how much it means to the children. My own father, who worked hard to help give me the opportunities I have enjoyed, was a custodial worker. I look forward to seeing many of you on Monday for our Staff Development Day, wish you a wonderful weekend, and once again, thank you for all that you do to make BUSD a great place for children to learn and grow. What an honor it was to meet and host school desegregation icon and education advocate Sylvia Mendez when she came to a celebration at the newly renamed Sylvia Mendez Elementary School (formerly LeConte Elementary School) on September 14. It was so fitting to welcome her almost 50 years to the day that Berkeley’s public schools voluntarily desegregated in 1968. As we mark this 50th anniversary year of the passage of our K-12 school integration plan and of the opening of the African American Studies Department at Berkeley High School, I am honored to have the commitment of key thought leaders and researchers from UC Berkeley Graduate School of Education to engage with us around important issues in educational equity in policy and practice. I hope you can join me for one or more of the Onward and Upward speaker events I am hosting this school year. In addition, Richard Rothstein, author of The Color of Law: A Forgotten History of How our Government Segregated America, and Distinguished Fellow at the Economic Policy Institute, will offer an afternoon speaking event on Tuesday, March 5 at 4:30pm. You’ve pulled off a huge feat! We’ve opened our doors and welcomed back almost 10,000 students, and from what I’ve seen, it’s been pretty smooth sailing. Thank you so very much! Below is the message and a back to school video that I’m preparing to send out to families. I hope you also enjoy seeing what’s been happening across our school district. A lot has been happening behind the scenes to prepare for this new school year, and it’s been a great first week back! We put this short video together so you might also share in the excitement of our students and staff and see inside our schools on this first week. Thank you for being a part of our Berkeley public schools family! ¡Para preparar este nuevo año escolar, han estado sucediendo muchas cosas tras bambalinas, y ha sido una primera semana de regreso a clases maravillosa! Recopilamos este pequeño video de manera que usted también pueda ser partícipe de la emoción de nuestros estudiantes y del personal docente y pueda observar el interior de nuestras escuelas en su primera semana. ¡Gracias por ser parte de nuestra familia de escuelas públicas de Berkeley! It’s here — The moment we have all been planning for since before summer began! Welcome to the start of the 2018-19 school year! Whether you went away on a big adventure or took a few days off here and there, one of the gifts of summer is the chance to reflect on what went well this past year, what challenged us, and what learning goals we want to set for ourselves and for our students. For me, this summer was a chance to work on the “art of doing nothing.” This meant carving out time to be still with my thoughts and focusing on being present in the moment. Some days this went better than others, but I’ve come to appreciate the power of my regular practice to create opportunities for deep reflection and relaxation. In doing so, one of the things I have learned is that time waits for no one and that there’s nothing more important than what is happening right now. As we begin the new school year, I’m also taking inspiration from a book I read this summer, The Obstacle is the Way. As Ryan Holiday suggests in this book, the keys to turning obstacles into opportunities are: perspective, action, and the will to stay focused. Rather than seeing an obstacle as the thing that prevents us from achieving our goals, Holiday suggests that the obstacle is, in fact, the path to the solution. His approach to turning trial into triumph is rooted in these words written by Roman emperor and philosopher Marcus Aurelius: The impediment to action advances action. What stands in the way becomes the way. In other words, with whatever we face, we have a choice. Will our progress be blocked by obstacles or will we advance through and over them? I hope you too will think about these ideas as we revisit our goals for ourselves and seek to inspire and engage every student. This year we will be intensely focusing on the third goal in our Local Control and Accountability Plan (LCAP), which calls on us to create a safe and welcoming school climate for all. A majority of our students are growing and thriving, and yet there are still others who are not experiencing success in our schools. Our challenge is to build strong relationships with our students and families so that together we offer them opportunities rather than obstacles, and promote their ability to turn adversity into advantage. As this school year marks 50 years of the voluntary racial integration of Berkeley’s public schools and the founding of Berkeley High School’s African American Studies Department, we are reminded of the path we have forged and the progress we have made, as well as the work we still have to do. An excellent, equitable, engaging and enriching education can and must be for everyone. Let us commit once again to the success of every student and together turn our vision of success for all into our legacy.